It’s a long time since I posted on this blog, but it has been on my mind recently,especially as I anticipate a very busy bookish week coming up. Last week there were various celebrations connected with the 3rd Library and Information Week here in Ghana, including the official launch in Koforidua (Eastern Region), with Ghana’s Second Lady as the Guest of Honour. 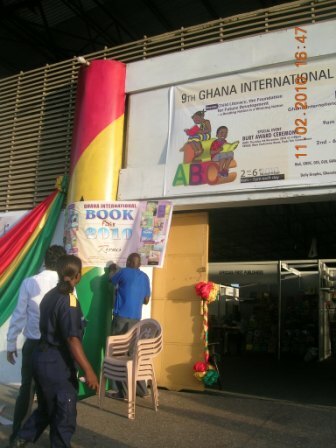 Looking forward the annual Ghana International Book Fair will be taking place here in Accra, from Tuesday 3 to Saturday 7 November. 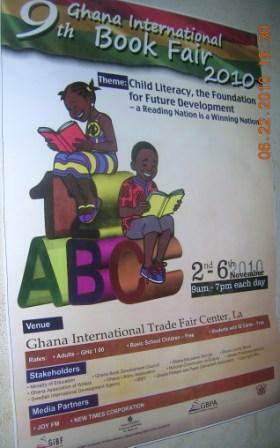 There are a lot of workshops and seminars, which bring together those involved in the book chain here in Ghana. For yours truly though I have to admit that what I really like about the book fair is the chance to stroll around the stands, and see whether there are any titles which strike my fancy. I know I really don’t need to buy any more books, but I find it very, very difficult to resist, despite overfull TBR shelves. And in the middle of the Book Fair week, the Ghana Library Association is having its AGM and Seminar, which should be fun, as I have managed to miss several GLA activities over the last year or so. As I mentioned in an earlier post, I haven’t posted for some time, and perhaps I should explain the reasons why in more detail. To begin with I had to have some surgery done on both of my eyes, which meant that reading was somewhat limited for much of April and May. And let me tell you, it was hard not to read so much! Plus I wasn’t physically in Accra, though I suppose I could have written about what else I was doing? And finally a close person in my life passed away, so lately I have been pre-occupied with burial and funeral arrangements, and other related matters. And of course work too is about to get very, very busy, as Ashesi University College is about to move from rented premises in three different compounds in Labone to its permanent site in Berekuso, on the old Aburi road. I haven’t posted much in the last month or so as I have been having some health issues attended to. I expect I will be resuming soon! Got this email from WordPress, and it does sound nice, though obviously I could do better! In 2010, there were 46 new posts, growing the total archive of this blog to 91 posts. There were 39 pictures uploaded, taking up a total of 3mb. That’s about 3 pictures per month. The busiest day of the year was May 20th with 43 views. The most popular post that day was Comments on post “Where do books for Africa go to die?”. The top referring sites in 2010 were ghanablogging.com, mail.yahoo.com, en.wordpress.com, twitter.com, and afrigator.com. Some visitors came searching, mostly for ghana international book fair 2010, bookshops in ghana, ghana book fair 2010, accrabooksandthings, and time out accra.